Clean MyPavers is a privately owned business which specializes in restoring, protecting and maintaining hardscapes. Clean My Pavers is a division of AFN Landscapes ~ The Paver Pros. AFN Landscapes began 30 years ago as a lawn service, later developing into a full-service landscape installer. 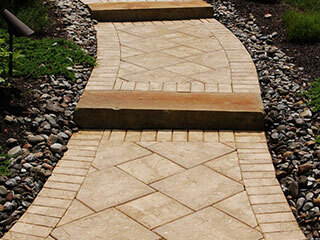 As demand grew, The PaverPros was developed in order to design and complete hardscape installations. Now these are becoming known as Dream Escapes or vacation spots in your backyard. Clean My Pavers maintains hardscaping and other outdoor surfaces. Our cleaning system includes hot water power washing with circulating water that functions like a giant waterized scrub brush. This system will clean many surfaces such as; concrete, concrete pavers, travertine, and natural stone. Clean My Pavers and The Paver Pros crew can repair any of the problems associated with your hardscaping. Sinking pavers can be lifted and reset. Edge restraints can be repaired or replaced. The joint sand that has washed out can be replaced and sealed, in order to stabilize the sand in the joints. Faded pavers can be cleaned and sealed in order to rejuvenate them. The Paver Pros can also replace any hardscapes in very bad condition, or add onto existing patios, walkways, driveways or pool-decks. Perhaps adding a water feature, fire feature, or grill area would increase the enjoy- ability of your outdoor living area. You can rely on The Clean My Pavers crew for all of your design, installation and maintenance needs. The experience obtained through 30 years in this business allows us to identify the needs of our customers. We strive to meet these needs on every level of service. "AFN Landscapes ~ The Paver Pros", "Clean My Pavers" and all employees are licensed and insured. In order to stay current with industry trends we attend yearly conferences and education seminars. The owner Anton Neugebauer is a graduate on Penn State University. He is meticulous and treats each project as if it was his own home. No job is complete until the cleaning is done. Clean My Pavers is working to keep your hardscaping investment as durable and sustainable as the day it was installed.